I always say: “Follow the money”. 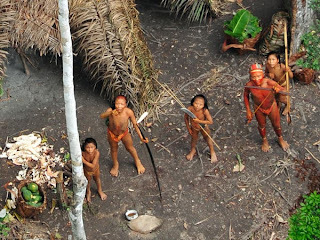 A couple of days ago, a lot of my green bloglinks were rhapsodic about those isolated Amazon tribes who were filmed from a plane. So when I checked on the group that released the photos and story, voila, sure enough: they are run by folks with very European/white American names, and their website is of course asking for funds to protect the poor Indians. Heck, at least here in the Philippines, they get someone from the local elites with a Pinoy name to be their front man. Sorry, but I’ve worked in (iron age agricultural) tribal areas of Africa, and the primitive life isn’t quite what the educated westerners crack it up to be. Which is why ten percent of the population of Zimbabwe is now living and working in South Africa rather than staying home and starving in the villages. Ever hear of the phrase: Nasty, brutish and short? That was written about the life of the average pre industrial age European peasant. And despite the claims by some that primitive life is an example of “sustainability”, they don’t seem to notice that most of these tribes have already “voted with their feet” and left. If they are so isolated, where did they get that brand new Machete, the iron pot,Â the cotton, and the banana leaves? All of these things come from the outside world. The green groups insist they got these things from “inter tribal trading”. But that in itself implies contact with other tribes who have contact with the outside world. Such contacts would be enough to spread infectious disease, including influenza and measles, two diseases which helped to decimate the original population of the Americas, and two diseases which vaccines could be life saving for this tribe. Let’s protect the tribes and allow them their original lifestyle, seems to be the argument. Ah, but if these tribes stay isolated, their population will grow, resulting in many of them having to chose between starving or moving elsewhere. Or maybe their population will stay stable, due to disease, injuries and infanticide, so that they can continue to live their traditional lifestyle. What will NOT happen is that they will live a happy carefree life so beloved of outside activists who never had to watch their children die of measles because they were malnourished and didn’t get measles vaccine, or die of malaria or typhoid or strep throat or simple diarrhea because there were no pharmacies with medicines or WHO rehydration fluid in their primitive village. Three, notice the BBC says the main dangers to the tribes is from “illegal logging”. Yeah, we have a lot of that here in the Philippines. But who is using all that beautiful hardwood? Answer: The rich, mainly in the “first World”…. So maybe a “say no to mahogany: Use cheap plywood furniture instead” initiative among the rich elites would make more sense. Or maybe start a campaign to certify where the wood came from, as they do with other products. Four: This story about these “isolated tribes” is not news, but propaganda. Send us money to save the poor Indians” seems to be the aim of the story. You can get all the local “activists” you want to talk into cameras about how they oppose change and love their primitive lifestyle, but this is not really about them. It is about getting rich Americans/Europeans can feel good about themselves. Because if people liked living this way, we wouldn’t have the NPA in the Philippines. The presence of communist insurgencies in our area was strong when there were no jobs here, and a lot of locals are ready to rejoin them if the economy gets worse in the near future. And it remains strong in the poorer areas of the Philippines, as does communist insurgencies in tribal areas of India. Just look at the communists winning the recent election to the government of Nepal. Yes, all those happy films about how those in Nepal loved their primitive lifestyle can’t explain this high percentage of the grass roots support for those promising to improve their lives. They may not want the greedy environmental destructive development of the western world, but neither do they want some outsider to pat them on the head and tell them they shouldn’t improve their life with the best of the modern world. Five: Preventing development by the west doesn’t mean no one else will try it. Right now, China is rushing into Africa with investments and bribes to teach African countries how to exploit their resources when “green” NGO’s and missionaries want to keep out the green revolution and stop people’s exploitation from evil western corporations. Nor is a Chinese development bad, since criminals also can go into these “isolated” areas forbidden to legal businesses, to grow drugs or smuggle out wood, diamonds, or gold. I am reminded of some (North) American Indian activists who went to south America to help locals fight oil exploration in one region. Several of these activists were killed, not by the oil companies but by the FARC related gunmen, who feared that they would prevent locals from being kidnapped to work in their drug labs. Six: When one is in charge of improving the lot of one’s citizens, shouldn’t the needs of the majority be taken into considerate? As the President of Peru pointed out, the insistence of outside pressure groups to stop the badly needed development of their petroleum and hydro electric resources (not to mention land that could grow food or minerals that could be used to increase the country’s wealth) ignores the good of the rest of the Peruvian people. The Amazon is huge, and the governments don’t see a problem with smaller areas being set aside, but the ultimate demands of these rich and powerful outside activists would harm the growing economies of the rest of the country. These “ain’t it awful/send us money to fight evil modern corporation” groups are valuable, because they put a mirror to the destruction of the environment and to how modernization can destroy a traditional way of life. We shouldn’t allow rich corporations to control all the propaganda in the media. But I wonder if these modern Luddites realize that if their policies are put into place, that they might save only a couple hundred “indigenous” Native, but cause the death from poverty of a couple hundred thousand Peruvians who are descended from the Incans and other tribes who welcomed the modern world that transformed their own primitive lifestyles one thousand years ago. Because the dirty little secret is that change will happen no matter what, and that the best a good government can do is try to limit the harm when it happens. 1 user commented in " The hoax of “Isolated tribes” "
Nice article. It sure made me look a little closer.